Princess Margaret, the Queen’s sister was the Princess Diana figure of her time. She was very popular as a teenager and young woman and was feted by large crowds and surrounded by paparazzi wherever she went. 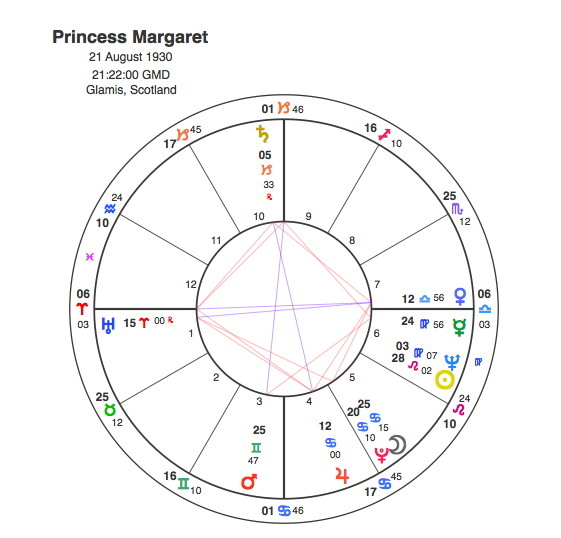 Princess Margaret’s chart had one thing in common with her sister’s – they both had Saturn in conjunction with the Midheaven. Both sisters in very different ways were required to make great personal sacrifices ( Saturn ) for the sake of the crown ( Midheaven ). Margaret was a Sun Leo, quite appropriate for a major figure in the Royal Family but her Sun was conjunct Neptune. Neptune belongs to the spiritual and ethereal realm, where things can easily be not what they seem. The planet deals with intangible things and it can easily have a dissolving and undermining affect on other planets that it aspects. Throughout her life Princess Margaret was seen by many as a figure that had a dissipating and subversive ( Neptune ) affect on the traditional role of the royals ( Leo Sun ). Margaret’s Moon in Cancer points to a sensitive, emotional person with strong ties to her family and her inheritance but the Moon is closely conjunct Pluto which means that these ties will be suddenly and radically transformed amidst much personal and emotional upheaval and change. Margaret also has a Grand Cross between Uranus in the 1st house, Jupiter in the 4th, Venus in the 7th and Saturn in the 10th. A Grand Cross is an aspect of considerable tension and difficulty because there are 4 planets all pulling in different directions. In many ways these four houses are the most critical in a chart because the cover the fundamental areas of life. The first house covers immediate personal concerns that have to be expressed and the 7th house is the area of our marriage so an opposition between planets in these houses creates tensions between our issues and the needs of the relationship. The 4th house is our link with our family and home background, the 10th is the career and social standing in the world so an opposition here creates difficulties and tensions in career / home balance. To have all 4 houses involved in a Grand Cross is very difficult because the needs of the family conflict with the individual and the relationship and the career. In Margaret’s case this problem is reinforced by the fact that the planets are in the 1st, 4th, 7th and 10th signs as well as houses. Margaret has Uranus in the first house conjunct the ascendant in Aries so she is naturally outspoken and rebellious. She has Venus in Libra conjunct the 7th house cusp so she’s a very attractive woman and the idealistic search for the perfect partner is an important theme in her life. She has Jupiter in Cancer in the 4th showing the tremendous inheritance and strong family connections that she has but also Saturn in Capricorn in the 10th requiring great personal sacrifice and duty to the crown and country. All these planets are pulling her strongly in different directions and her life would naturally keep throwing up issues that would be hard to resolve because they would impact on all of those essential areas of life at the same time. One very simple way of explaining the symbols in Margaret’s Grand Cross would be to say that she was strongly attracted to relationships ( Venus in Libra in the 7th ) that were unconventional ( Uranus in the 1st ) with assertive men ( in Aries ) and were considered contentious ( opposition ) which would cause great tension ( squares ) with the Royal Family ( Jupiter in Cancer in the 4th ) and the authorities ( Saturn in Capricorn in the 10th ). So how would this chart play out in her life. After the war, Margaret fell for the love of her life, dashing war hero Group Captain Peter Townsend. Unfortunately Townsend was a married man, twice her age, with two children. Townsend has a perfect chart for a military captain with the Sun in Scorpio, Moon in Capricorn and Sagittarius Ascendant with Mars rising. Mars and Venus conjunct the Ascendant shows how attractive he was. The synastry between Margaret’s chart and Townsend’s was astonishingly strong and astrology would certainly back up the widely held view that this was the real love of her life. Margaret’s Leo Sun was exactly square to Townsend’s Scorpio Sun, her Cancer Moon was in close opposition to his Capricorn Moon and her Aries Ascendant in exact trine aspect to his Sagittarius rising. It is extremely rare to have such powerful contacts between the three main personality significators in two charts and no wonder they fell so deeply in love. Townsend, however had an exact Saturn / Pluto conjunction in his 7th house of relationships indicating sudden powerful change but of an essentially restrictive and frustrating nature, stopping him from getting the partner he really loved. He also had a Moon / Neptune opposition pointing to something occurring that would have a debilitating and undermining effect on his emotional life. His Neptune was also conjunct Margaret’s Moon having the same effect on her. 1952 -3 was a watershed for the House of Windsor. Margaret’s father George VI died, her sister became sovereign, and Townsend divorced his first wife. Early the following year, he proposed to Margaret. Although Townsend’s break-up with his wife was nothing to do with Margaret, he became tainted in the eyes of society. In the 1950s, divorce was a dirty word. Many in the government felt that he would be an unsuitable husband for the Queen’s sister and the Church of England refused to countenance a marriage to a divorced man. The affair became one of big the issues of the time but in 1955 Margaret bowed to the inevitable and issued a statement which announced that “mindful of the Church’s teaching” she would not marry Peter Townsend. That this was the major turning point in Margaret’s life was confirmed by the fact that Pluto was conjunct her Sun in 1955. It was also square to Townsend’s, the only aspect that it would make to his Sun in his lifetime. Townsend went on to marry a Belgian girl as Pluto was conjunct his Ascendant. Apparently Margaret decided to marry Anthony Armstrong-Jones in October 1959, on the same day that she received a letter from Townsend announcing his engagement. Antony Armstrong-Jones was almost the complete opposite character to Peter Townsend. Armstrong-Jones was a photographer in fashion, design and theatre. 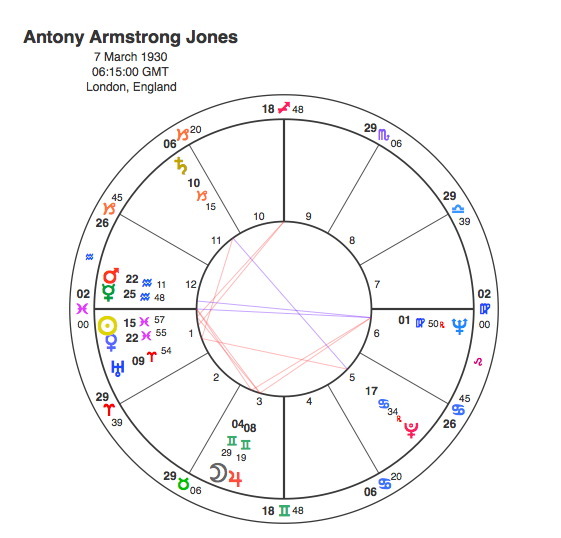 Capricorn Research has found the most common Sun sign amongst artists to be Pisces, Armstrong-Jones has the Sun and Ascendant in this sensitive sign. He also has a T Square including a very close opposition from the Ascendant to Neptune, the ruling planet of Pisces. Neptune is conjunct the 7th house cusp so its energy would dominate all of Armstrong-Jones’ relationships. Neptune is the planet of mystery, fantasy and dreams. It can create a spiritual connection between couples but the dream can often turn into an illusion particularly with difficult aspects. The opposition focuses by T Square onto a conjunction between the Moon and Jupiter in Gemini in the 3rd house. A Moon / Jupiter conjunction is an uplifting contact to have in any chart. This T Square could easily be interpreted as belonging to a sensitive, artistic individual ( Pisces rising ) who enters into relationships that have a fantastic, dreamlike quality ( Neptune in the 7th ) although they are also nebulous and impractical ( Ascendant opposite Neptune ) but they result in great creative advantage him ( Moon conjunct Jupiter ) particularly in terms of exposure and communication with the wider public ( Gemini in the 3rd house ). All the points in the T Square are in Mutable signs so any relationship is unlikely to last forever. Princess Margaret married Antony Armstrong-Jones in May 1960. Pluto was in the Armstrong-Jones’ T Square in 1960, conjunct Neptune opposite his Ascendant and square to the Moon / Jupiter conjunction. This was a major turning point in his life and obviously the relationship indicated by the T Square in his birth chart. This transit confirmed that he had married his princess. There were no major Pluto aspects for Margaret, however, suggesting it wasn’t the most momentous event of her life. Armstrong-Jones was made Earl of Snowdon. His career in photography grew considerably due to the extra exposure from his marriage and it reached a peak in 1965 when he published his book ‘ Private View ‘. Pluto was square Armstrong- Jones Sun in 1965. Both Margaret and Snowdon enjoyed the high life and they were drawn to alcohol and drugs. In a way this was to be expected as both had strong aspects to Neptune, the planet that rules intoxicants. Rumours of a rift started after seven years of marriage and their arguments became legendary. They struggled on for years before separating. Various causes may have lain behind the failure. On her side there was a penchant for late-night partying, on Snowdon’s, an undisguised sexual promiscuity. There were rumours that Snowdon was gay or bisexual and one man claimed that he had an affair with him before the marriage to Princess Margaret. From an astrological perspective these rumours were entirely possible. Snowdon’s double Pisces with the Moon in Gemini would create a personality that would be constantly fluid and shifting, very experimental and not wishing to be tied down to any particular way of behaving. Neptune on the 7th cusp would tend to add a mystique to his relationships and the distinction between different types of behaviour would be blurred for him. In 1973, Margaret met Roddy Llewellyn. Llewellyn was seventeen years her junior. In 1974, he was a guest at the holiday home she had built on Mustique. In 1976, a picture of Margaret and Llewellyn in swimsuits on Mustique was published on the front page of the News of the World. The press portrayed Margaret and Llewellyn as a predatory older woman and her toyboy lover. There were calls to remove her from the Civil list. The Snowdon’s marriage ended in divorce in 1978. The strong reactions that this provoked may seem strange now but Margaret was the first royal to divorce since 1901. Pluto was in Margaret’s difficult Grand Cross from 1976 to 78, the only time it would transit this pattern in her life. Pluto was conjunct her 7th house Venus so she was in love with Llewellyn but it was obviously difficult and traumatic for her as Pluto was also opposite her Uranus and in the other half of the pattern, square her Jupiter and Saturn meaning that it had massive repercussions for the Royal Family and the British establishment in general. 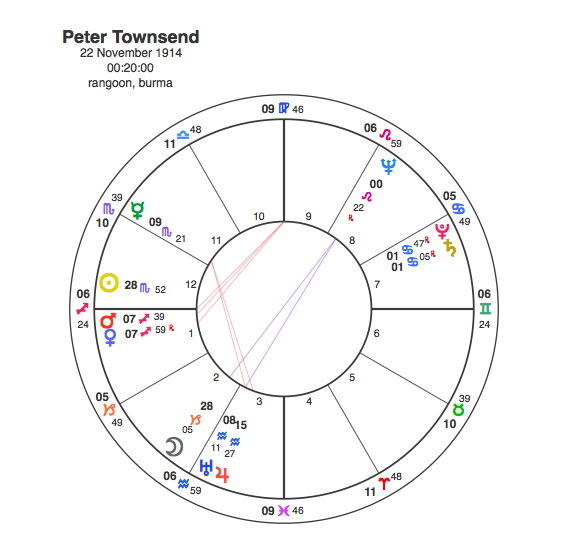 Whilst the end of the affair with Peter Townsend was just a problem for her ( Pluto conjunct her Sun ), the impact of this divorce was felt widely ( Pluto aspecting planets in 4 different houses ). The Royal Family had a taste of the kind of problems and publicity that would haunt them again with the next generation 14 years later. Roddy Llewellyn was heir to a baronetcy but was working as a garden designer. There is no birth time available so a noon chart is used. Roddy Llewellyn has the Sun in Libra in conjunction with Margaret’s Venus so the attraction was clear despite the age gap. He also had the Moon in Leo, Margaret’s Sun sign so there was a natural emotional empathy between them. Like Margaret, Llewellyn has the Sun conjunct Neptune so whilst these two were genuinely in love it was unlikely to last, Neptune just has a way of slowly dissolving things and its not a planet that points to long term security. It’s interested in spiritual connection and it may well be that the couple found this in each other. Llewellyn’s relationship with Margaret was undoubtedly the watershed event of his life. Pluto was conjunct his Sun in 1978 when their relationship caused the Snowdon’s divorce. Their relationship lasted 8 years but in the end, the age gap was too great and Llewellyn married a younger woman. He was Princess Margaret’s last love. Its interesting that all the players in this drama had strong Neptunes. 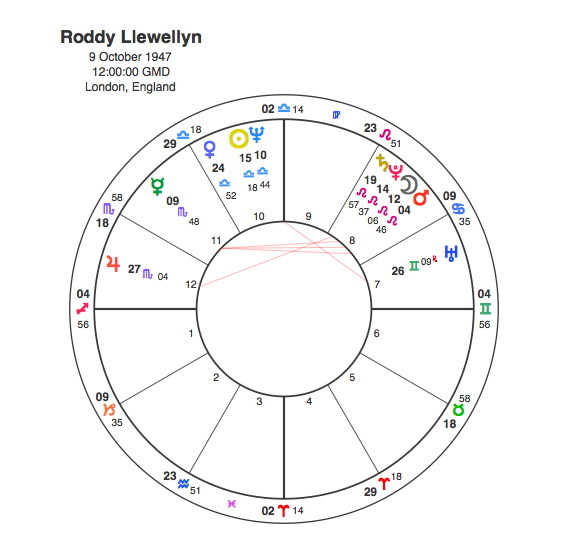 Princess Margaret and Roddy Llewellyn had the Sun / Neptune conjunction, Peter Townsend had the Moon / Neptune opposition and Lord Snowdon had the strongest of the lot, Neptune in the 7th house opposite his Ascendant and square his Moon. They all had interesting love lives as they pursued their Neptunian dreams. Pluto as usual was the planet that marked all the significant developments both for Margaret and her lovers but also for the Royal Family and the British establishment. Many aspects of Princess Margaret’s life made things difficult for her sister, the Queen, but this was really just a practice run for Pluto’s real blitz on the House of Windsor in 1992.